When Rubia Ferreira first met Tyler Campbell in Okinawa, Japan, they got to talking and she wanted to know if he could cook. So how did Tyler answer Rubia’s question? He stepped up to the stove and cooked her dinner on their first date! This couple can not only cook, they’re well-traveled. At the time they met, Campbell was stationed on the island as a combat engineer with the United States Marines and Rubia was taking time to see the world. Life’s journey has taken them pretty far since meeting in Japan. Once the couple found out they were expecting, they made the trip to Tyler’s hometown of Jasper for a visit before their daughter was born. That’s when their path turned unexpectedly. Rubia fell ill and was diagnosed with HELLP syndrome, which threatened her and the baby’s life. She was admitted to UAB for an emergency c-section and the couple’s daughter, Kaelin, was born Nov. 8, 2017 at 24.4 weeks. She was only 14 ounces and fighting serious lung issues. By the time they’d arrived in Alabama, Rubia and Tyler were engaged but Kaelin’s early birth changed their plans. 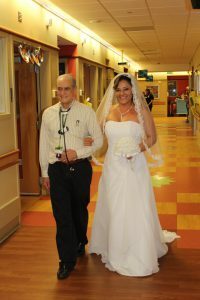 Tyler floated the idea of getting married in Kaelin’s room at the UAB Regional Neonatal Intensive Care Unit (RNICU). UAB staff jumped into high gear after hearing about the situation and multiple departments came together to find decor and sew a silk-ribbon bouquet, arrange refreshments and music and more. 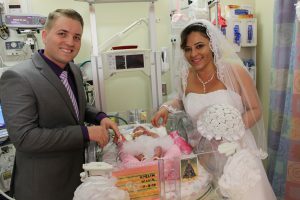 The dream wedding took place on February 14, 2018 and Kaelin’s neonatologist Dr. Waldemar Carlo walked Rubia down a makeshift aisle to Kaelin’s room. The wedding date just happened to be within a few days of Kaelin’s original due date! 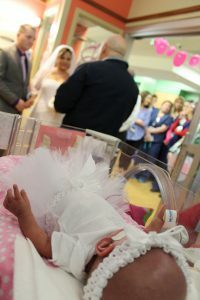 It was a special day for a special couple and their little girl. While Kaelin has been in the hospital, Tyler and Rubia have found comfort and care at the Ronald McDonald House. 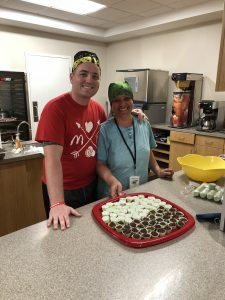 Rubia can often be found cooking in the Family Kitchen and she and Tyler are so grateful for their guest room that they cooked dinner one night in March because they wanted to give back. The family is continuing forward on their journey and hope Kaelin can be discharged soon.